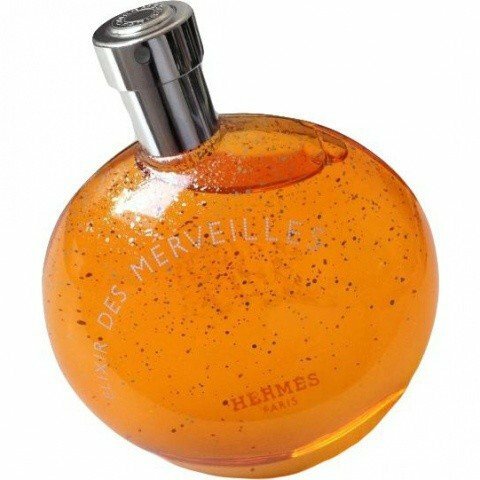 Elixir des Merveilles is a popular perfume by Hermès for women and was released in 2006. The scent is spicy-woody. The longevity is above-average. It is still in production. Wonderful sweet perfume, highest quality with exquisite bottle. The packaging is to die for. This is my first perfume from Hermes and I was happily surprised with this unique smell. I tried this under an enormous heat while at summer holidays and the perfume never turned bitter while the aroma followed me all day long. I am sure Hermes has a lot of fans with such creations. The smell is like orange peals covered in sugar and dipped in brandy. Super perfume indeed !!!!! I received a sample of this from a friend. In a nutshell: It's a very strong, intense orange creamsicle and is almost identical to Laura Biagiotti's Roma per Uomo, except that the Eau des Merveilles is so much stronger. If you want a light version of this, Roma per Uomo is the way to go and relatively cheap. You should be able to get a bottle of it for around $30 on Ebay. Here is a scent for the bold and the cozy all in one. Never encountered a scent so contradictionary nor excentric. Elixer des Merveilles feels like wearing lots of diamonds on the beach, having strawberries and chocolat for dinner and wearing a tuxedo while shopping late at night in a supermarket. Jean-Claude Ellena is a genius, especially in regards to composing his fragrances using a wide range of ingredients, some that you would never believe could go hand in hand. Elixir des Merveilles is a lot bolder and richer than Eau des Merveilles, and in some ways, a touch more masculine. It opens with aromatic orange peel, foody caramel and chocolatey accords. Before jumping on the gourmand bandwagon, Elixir des Merveilles settles rapidly into a musky, and slightly soapy woods and orange blend. This complex blend keeps me intrigued throughout Elixir des Merveilles' development. The soapiness that I'm referring to is not necessarily clean smelling, but more like the sharp scent of laundry powder. This is the point where I praise this fragrance to the high heavens, but admit that it does absolutely nothing for me when I wear it. I've worn Elixir des Merveilles twice now, and I can honestly say that it's unique and beautiful, yet disturbing at the same time. It's that mish-mash of sugar meets masculine citrus, then along the way bumps into bitter dark chocolate and earthy woods. Confusing at best, but still an absolute masterpiece, but unfortunately one that isn't for me. The drydown was a lot more powdery than I thought it would be, but I openly welcomed the slightly more feminine finish. Due to its heavy nature, I would personally wear it in the cooler months, but if applied with a light hand, I suppose it could wear well during Summer too. Despite Elixir des Merveilles not turning out to be something that I personally considered bottle-worthy, I'm not at all disappointed. Sometimes it's the scents that don't quite work for you, that stay in your mind the longest. Works in a way probably not intended. The risk is that Elixir might read as indistinct. The upshot is that it suggests an ambiguity that can be very alluring, and as most men tend to steer clear of ambiguity in fragrance, perhaps Elixir would make a great men's fragrance. orange note and the drydown sweet Caramel with amber very unsual it has a amberish drydown a unique creation indeed i'm not going to debate this does not smell like chocolate it's amberish and caramel. and it's a bit heavy so wear it lightly. Hermès Elixir des Merveilles manages to roll together the best qualities of amber and gourmand perfumes into one scrumptious creation. The amber is golden, shimmering and viscous, while the orange facet is sweet and somehow resinous. The vast majority of fragrances boasting orange as a note wind up as citrus colognes, and many amber perfumes smell alike in the drydown. Not Elixir des Merveilles, which manages to roll amber and orange together into a unique and compelling perfume. This extraordinary creation, like everything Hermès makes, exudes quality, and this perfume in particular verily oozes sensuality. Vanilla sugar and patchouli may sound like you're in for yet another instantiation of a trite and overdone fad, but in this composition they are perfectly measured and balanced by balsam, incense, oak, and cedar, with the result that the final perfume product is essentially a seamless piece of satin effortlessly piled upon itself both to reflect light and to create shadows. A gorgeous perfume and a great pleasure to wear. This one is simply scrumptious. It starts out with more of a chocolate scent than orange, which surprised me given the bottle. Very fine quality European chocolate – sweet, but not too sweet, creamy yet a little dry (dark chocolate?). As the scent develops, the chocolate becomes more subdued and I get more woods and a soft candied (not tart) orange . Really nicely blended, unique orange chocolate scent. Would be great for a special holiday scent, or pretty much any time. Orange dipped in chocolate... yum! I get a bit of a boozy note now and then. Very much a comfort fragrance! Settles woodsy on my skin and I have not found it to have the lasting power that everyone seems to adore, 3hr maybe? warm and zesty at the same time, it's a wonderful and longlasting scent contained in a "magic ball". Perfect in every season. High price.